Two previous uncontrolled studies have suggested that noninvasive mechanical ventilation (NIMV) in patients with hypercapnic chronic obstructive pulmonary disease (COPD) improves arterial blood gas tensions by decreasing lung hyperinflation with the consequent reduction in inspiratory loads and changes in ventilatory pattern. The aim of this randomised placebo-controlled study was to determine whether these mechanisms play a pivotal role in the effects of NIMV on arterial blood gases. Thirty-six stable hypercapnic COPD patients were randomly allocated to NIMV or sham NIMV. A 2-week run-in period was followed by a 3-week study period, during which ventilation was applied 3 h·day−1, 5 days a week. Arterial blood gases, spirometry, lung volumes, and respiratory mechanics were measured before and after application of NIMV. Patients submitted to NIMV showed changes (mean (95% confidence interval)) in daytime arterial carbon dioxide tension (Pa,CO2) and arterial oxygen tension of −1.12 (−1.52–−0.73) kPa (−8.4 (−11.4–−5.5) mmHg) and 1.14 (0.70–1.50) kPa (8.6 (5.3–11.9) mmHg), respectively. Total lung capacity, functional residual capacity (FRC) and residual volume were found to be reduced by 10 (7–13), 25 (18–31), and 36 (27–45)% of their predicted value, respectively, whereas forced expiratory volume in one second and forced vital capacity increased by 4 (1.5–6.9) and 9 (5–13)% pred, respectively. Tidal volume (VT) increased by 181 (110–252) mL. All of the above changes were significant compared with sham NIMV. Changes in Pa,CO2 were significantly related to changes in dynamic intrinsic positive end-expiratory pressure, inspiratory lung impedance, VT and FRC. It was concluded that the beneficial effects of noninvasive mechanical ventilation could be explained by a reduction in lung hyperinflation and inspiratory loads. This study was supported by grants no. 196/0924 and 199/0513 from Fondecyt. Noninvasive mechanical ventilation (NIMV) has been consistently shown to reduce hypercapnia and hypoxaemia in patients with a variety of chronic hypoventilatory disorders 1. By contrast, studies with intermittent NIMV in chronic obstructive pulmonary disease (COPD) patients have yielded conflicting results, but patients with severe COPD and hypercapnia appear most likely to benefit 1, 2. The mechanisms underlying changes in arterial blood gas tensions induced by NIMV in COPD are not completely understood. It has been suggested that NIMV may reduce work of breathing, facilitating recovery from inspiratory muscle fatigue 1, 2. However, this hypothesis was not supported by the study of Elliott et al. 3, who suggested that hypercapnia is reduced due to a combination of lower loads, lung deflation and decreased central respiratory drive. In a previous uncontrolled study, the present authors found that NIMV improved arterial blood gas tensions in chronic hypercapnic COPD subjects 4. They postulated that the main effect of NIMV was a reduction in inspiratory load, possibly secondary to a decrease of lung hyperinflation. In order to assess the above hypothesis, the authors conducted a randomised, placebo-controlled study of the physiological effects of NIMV in COPD patients with stable hypercapnic respiratory failure. Fifty-six consecutive patients receiving chronic care at the Universidad Católica de Chile (Santiago, Chile) outpatient clinic for COPD 5 with moderate-to-severe chronic respiratory failure (resting daytime arterial carbon dioxide tension (Pa,CO2) ≥6.65 kPa (50 mmHg), an arterial oxygen tension <7.98 kPa (60 mmHg)), and in a clinical and functional stable state were evaluated. Sixteen patients were excluded: four patients with clinical exacerbations during the preceding 4 weeks, four with a 10% increase in forced expiratory volume in one second (FEV1) after the administration of an inhaled bronchodilator, three with a body mass index of ≥30 kg·m−2, one with a history of asthma, two with obstructive sleep apnoeas, and two with other concomitant lung or cardiovascular disorders (bronchiectasis, left ventricular failure). Forty patients agreed to participate in the study, which was approved by the Ethics Committee of the Universidad Católica de Chile, Chile. Informed consent was obtained from the patients before enrolment into the study. All patients were using inhaled β-agonists, 10 subjects in each group were also taking ipratropium bromide, and all but two subjects in each group were using theophylline. Three patients in each group were using inhaled steroids, and three controls and two NIMV patients were taking systemic steroids (prednisone: 5–7.5 mg·day−1). No patient was on diuretics. All patients had stopped smoking for ≥1 yr before the study and were on long-term oxygen therapy. None were participating in a respiratory training programme nor were receiving home mechanical ventilation. No patient had previous exposure to NIMV. A two-arm, single-blinded, randomised study of active NIMV versus sham NIMV (s-NIMV) was designed. The study was blinded for patients and physicians responsible for their clinical care. Based on the authors' pilot work 4 and in previous reports 1, it was estimated that a sample size of ≥18 subjects for each arm was required to detect a difference of ≥0.67 kPa (5 mmHg) in Pa,CO2, with a power of 80% and an alpha level of 5%, using an unpaired two-tailed test of statistical significance. Patients first entered a 2-week run-in period, using their current medication, during which they were familiarised with measurements. Spirometry, arterial blood gases and clinical status were assessed at the time of recruitment and at the end of the second week. This was followed by a 3-week study period, during which they were randomly allocated to NIMV or s-NIMV using a table of random numbers. To assure a correct application of the treatment regimen, ventilation was applied under direct supervision at the pulmonary function laboratory, on an outpatient basis. NIMV was delivered through a silicone face mask (Hans-Rudolph, Kansas City, MO, USA) via a bilevel positive airways pressure (BiPAP) ventilator system in spontaneous mode (model S/T-D; Respironics Inc., Murrysville, Pennsylvania, USA) and s-NIMV via a Siemens Servo ventilator 900C (Siemens, Solna, Sweden) in continuous positive airways pressure (CPAP) mode. NIMV and s-NIMV were applied 3 h·day−1, 5 days a week, during 3 weeks, as previously described 4. In the NIMV group, the level of inspiratory positive airways pressure (IPAP) was gradually increased from 8 cmH2O, by 2 cmH2O steps during the first hour of ventilation, to obtain the highest tolerated level that was subsequently held constant for the rest of the study. The mean level of IPAP used was 18±2 cmH2O, whereas the expiratory positive airway pressure was set at minimum (2 cmH2O). A similar approach has been used in previous studies 6, 7. In the present study, the main objective of high inspiratory pressures was to induce major changes in the pattern of breathing during the ventilation sessions 8. It has been reported that changes in the pattern of breathing could reduce lung hyperinflation both in mechanically ventilated patients 9 and in COPD patients during exercise 10. In the s-NIMV group, a low level CPAP of 2 cmH2O was used in order to reduce the imposed work of breathing of ventilator circuits 11. The protocol allowed administration of supplemental oxygen in variable concentrations for both groups in order to maintain an arterial oxygen saturation (Sa,O2) of ∼94% during sessions. No patient in the NIMV group needed supplemental oxygen to achieve the target Sa,O2, whereas all controls were supplemented with a mean inspiratory oxygen fraction of 0.25±0.02. All other therapies were maintained unchanged throughout the study. Baseline measurements, including arterial blood gas tensions, spirometry, lung volumes, and respiratory mechanics were evaluated at the end of the run-in period, and reassessed 24 h after the last session of mechanical ventilation. Subjects were studied sitting upright in a comfortable chair, breathing room air, ∼2 h after inhalation of their bronchodilating medications. Spirometry was performed with a calibrated dry spirometer (Vitalograph®, London, UK) according to American Thoracic Society standards 12. Absolute lung volumes were measured with the nitrogen-washout method (SensorMedics Corp., Yorba Linda, CA, USA). Maximal expiratory flow/volume curves were constructed by plotting maximal expiratory flows against their respective lung volumes: total lung capacity (TLC), peak expiratory flow rate, 75%, 50% and 25% of forced vital capacity (FVC) and residual volume (RV). Reference values from Knudson et al. 13 for spirometry and from the European Community for Steel and Coal for lung volumes 14 were used. Resting daytime arterial blood gases were measured with a Ciba Corning 238 gas analyser (Ciba Corning Diagnostic Corp., Massachusetts, USA). Airflow was measured with a heated Fleisch number 2 pneumotachograph (Fleisch, Lausanne, Switzerland) and a differential pressure transducer (MP45, ±2 cmH2O; Validyne Corp., Northridge, CA, USA). Volume was obtained by numerical integration of the flow signal. Tidal volume (VT), inspiratory (tI) and expiratory time (tE), total breath duration and the mean inspiratory flow (VT/tI) were obtained as average values from 1-min records of flow and volume. Pressure at airway opening (Pao) was measured through a side port of the mouthpiece using a differential pressure transducer (MP45, ±100 cmH2O). Oesophageal (Poes) and gastric (Pga) pressures were measured using two balloon-tipped catheters connected to two differential pressure transducers (MP45, ±100 cmH2O), located in the middle third of the oesophagus and in the stomach, respectively. Transpulmonary (PL) and transdiaphragmatic (Pdi) pressures were obtained by subtracting Poes from Pao and Pga, respectively. 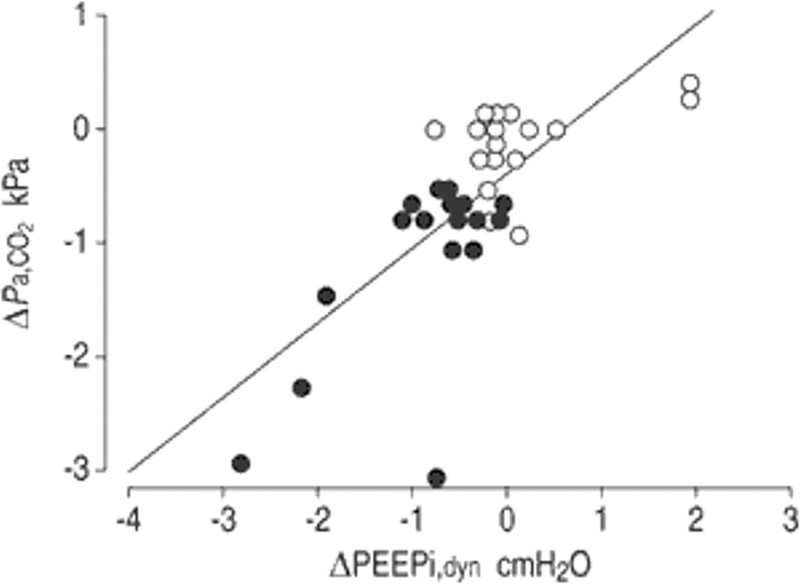 Dynamic intrinsic positive end-expiratory pressure (PEEPi,dyn) was measured from the transpulmonary signal 15, corrected for expiratory muscle activity 16. The inspiratory PL profile was divided into elastic and resistive components as previously described, to allow calculation of dynamic lung elastance (EL,dyn=dynamic lung compliance−1) and inspiratory lung resistance (RL) 15. Mean inspiratory pressure swings (PI) were measured from PL (PI) and Pdi signals, respectively. Maximal inspiratory pressure (PI,max) was measured at the mouth from functional residual capacity (FRC). Maximal Pdi (Pdi,max) was measured during Mueller manoeuvres against an occluded airway at FRC. Airway occlusion pressure was measured using a one-way valve (Hans-Rudolph) connected to an electrically driven occlusion valve attached to the inspiratory line 17. Effective lung impedance was determined as the PI/VT/tI ratio. Effective respiratory system impedance (P0.1/VT/tI) was calculated as previously described 18. The pressure/time product of the diaphragm (PTPdi) was obtained by measuring the area under the Pdi/time relationship 19. The tension/time index of the inspiratory muscles (TTI) and of the diaphragm (TTdi) was calculated as reported 15, 20. In a subset of 16 patients (eight per group), the pattern of breathing and respiratory mechanics were measured during mechanical ventilation on the first day of the study. The patients were studied in a semirecumbent position once they were accustomed to the experimental setting and appeared to be relaxed (∼1 h after institution of mechanical ventilation). During NIMV, the pneumotachograph was inserted between the face mask and the nonrebreathing valve of the ventilator circuit and during s-NIMV, between the Y-piece of the ventilator and the face mask. Pao was sampled via a side port inserted between the face mask and the pneumotachograph. All other variables were obtained as previously stated. Pressure and flow signals were amplified (AC Bridge amplifier-ACB module; Raytech Instruments, Vancouver, BC, Canada) and sampled simultaneously at a rate of 100 Hz by a 16-bit analogue-to-digital converter (Direc Physiologic Recording System; Raytech Instruments). The results are expressed as mean±sd. Baseline values of experimental groups were compared using an unpaired t-test. Changes in experimental groups were compared using a two-way analysis of covariance controlling for baseline values. Changes within each group were reported as mean and 95% confidence interval. Relationships between the changes in Pa,CO2, PEEPi,dyn and those in spirometry, lung volumes, respiratory mechanics, and inspiratory muscle function, were assessed using Pearson correlations and linear regression analyses. Statistical significance was defined as a two tailed p-value of <0.05. Two patients were excluded because their Pa,CO2 fell below 6.65 kPa (50 mmHg) during the run-in period and two because of a clinical exacerbation. Among the 36 randomised patients, mean FEV1 and Pa,CO2 were 755±203 mL and 7.45±0.67 kPa (56±5 mmHg) at the time of recruitment, and the mean changes during run-in period were not significant: 11 (−4.5–26) mL and 0.06 (−0.01–0.12) kPa (0.42 (−0.07–0.90) mmHg) respectively. Baseline characteristics of the 18 treated and 18 control subjects are shown in table 1⇓. Figure 1⇓ shows the changes in the pattern of breathing from spontaneous breathing to s-NIMV or NIMV in the eight patients of each group measured during the first day of the study. As expected, using a high-level inspiratory pressure setting led to significant increases in VT and tE (p<0.01) during NIMV. By contrast, no changes in the pattern of breathing were found in controls. Spirograms comparing the breathing pattern during spontaneous breathing (•) with the breathing pattern during a) sham noninvasive mechanical ventilation (continuous positive airway pressure, ○) and b) noninasive mechanical ventilation (bilevel positive airway pressure, ○) in eight patients from each group. Values are presented as mean±sem. VT: tidal volume. In the eight controls, changes in PTPdi were not significant (from 408±113 to 438±113 cm H2O·min−1), indicating that sham ventilation with the Siemens Servo ventilator was not associated with a significant increase in the inspiratory load. In contrast, in the eight patients studied, a significant reduction in PTPdi compared with spontaneous breathing, was found after institution of NIMV (from 394±99 to 203±79 cmH2O·min−1; p<0.001), indicating a 48% reduction in diaphragmatic load during assisted ventilation. At the end of the NIMV treatment period, a slow and deep pattern of breathing was spontaneously maintained and significant improvements in arterial blood gases were found (table 2⇓). Changes in Pa,CO2 were of variable magnitude, with six patients exhibiting a reduction between 1.06–3.06 kPa (8–23 mmHg), whereas in the other 12 subjects it ranged only from 0.53–0.80 kPa (4–6 mmHg). Those patients with greater changes showed higher baseline values of Pa,CO2 (p<0.05) and higher but nonsignificant values of PEEPi,dyn, PI, PI/VT/tI, PI/PI,max, suggesting that they had a more advanced disease. Subsequently, all comparisons were performed with and without those six patients, but no differences were found. The NIMV group also exhibited significant reductions in FRC and RV, and a mild decrease in TLC, whereas FEV1, FVC, and forced mid-expiratory flow increased. Changes in FEV1 and FVC were found to be proportional, as the FEV1/FVC ratio did not vary. A reduction in mechanical loads and respiratory centre drive was also observed (table 3⇓), in terms of EL,dyn, RL, PEEPi,dyn, PI, TTI, and P0.1. Although PI,max and Pdi,max increased after NIMV in comparison to baseline values, the change was not significant when compared to control subjects (table 3⇓). 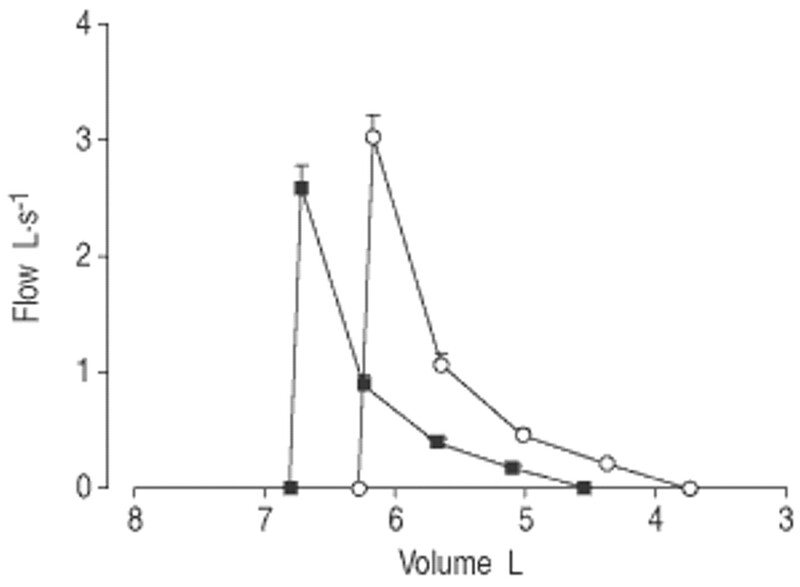 Figure 2⇓ shows the baseline and final composite maximal expiratory flow/volume curves in absolute values for the NIMV group. After NIMV, RV was reduced more than TLC, resulting in a mean increase in FVC of 259 (145 to 372) mL, isovolume expiratory flows increased, and the convexity of the flow/volume loop remained unchanged. FRC was also found to be reduced more than TLC, resulting in an increase in inspiratory capacity of 235 (177–292) mL. Baseline (▪) and final (○) maximal expiratory composite flow/volume curves in noninvasive mechanical ventilation patients. Curves were constructed by plotting maximal expiratory flows against their respective lung volumes: total lung capacity, peak expiratory flow rate, 75, 50 and 25% of forced vital capacity and residual volume. Values are presented as mean±sem. Changes in Pa,CO2 were most strongly related to ΔPEEPi,dyn (r=0.72; p<0.0001), as shown in figure 3⇓. The changes in both parameters were closely related to changes in several lung function parameters, including changes in lung volumes, such as FRC and inspiratory capacity (table 4⇓). In addition, the changes in PEEPi,dyn after NIMV were highly related to baseline values (r=−0.88) and the regression line was significantly different compared with after s-NIMV (p<0.001), as shown in figure 4⇓. Relationship between changes (Δ) in the carbon dioxide tension in arterial blood (Pa,CO2) and dynamic intrinsic positive end-expiratory pressure (PEEPi,dyn). •: noninvasive mechanical ventilation patients; ○: control subjects. Regression line: ΔPa,CO2: −2.9+4.9×ΔPEEPi,dyn (r2=0.52; p<0.0001). Relationship between changes in dynamic intrinsic positive end-expiratory pressure (ΔPEEPi,dyn) and baseline values. Closed circles and the full regression line apply to noninvasive mechanical ventilation patients, where ΔPEEPi,dyn=0.26−0.43×baseline PEEPi,dyn (r2=0.77; p<0.0001). Open circles and dashed regression line represent control subjects, where ΔPEEPi,dyn=0.38−0.09×baseline PEEPi,dyn (r2=0.02). The main findings of the present study are: 1) short-term application of intermittent NIMV to stable hypercapnic COPD patients decreases lung hyperinflation, thus reducing inspiratory loads; and 2) the concomitant reduction of hypercapnia was related to the decrease in lung hyperinflation. The results are in agreement with those of Elliott et al. 3, who found that the decrease of hypercapnia after NIMV was related to a reduction in inspiratory loads, gas trapping, and central breathing drive. Indeed, an inverse relationship was found between the increase in VT and the reduction in mechanical loads, such as EL,dyn, (r=−0.70; p<0.0001) and PEEPi,dyn (r=−0.52; p<0.01). In addition, the close relationship between the changes in Pa,CO2 and ΔPEEPi,dyn (fig. 3⇑) suggests that reduction of dynamic lung hyperinflation is an important mechanism underlying changes in arterial blood gas tensions. 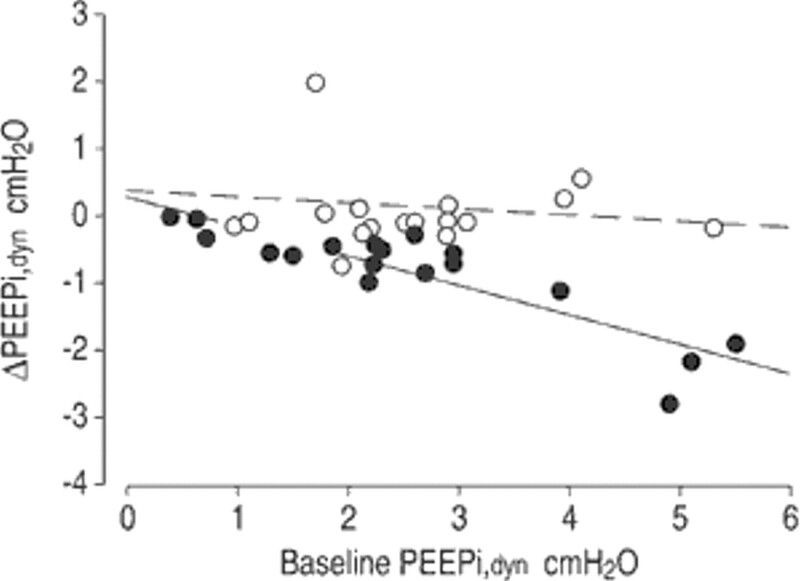 It must be stressed that PEEPi,dyn, as measured in the present study, reflects the lowest regional end-expiratory alveolar pressure and most probably underestimates the threshold load resulting from dynamic hyperinflation. Interestingly, a reduction in PEEPi,dyn that closely resembles that found in these patients was present in the study of Nava et al. 21 after 4 weeks of NIMV. Although the changes (from 2.4±1.4 to 1.9±1.8 cmH2O) were not significant, the number of patients studied was small and beta error could have influenced their results. Indirect evidence for changes in inspiratory loads were also described by Fernandez et al. 22, who found a sustained decrease in mean oxygen consumption after only two sessions of NIMV, suggesting a reduction in the work of breathing. Conversely, recovery from respiratory muscle fatigue appears to be an unlikely explanation for the present findings. Although a reduction of the diaphragm load was found during NIMV, in line with previous reports 8, 23, the TTdi found in the patients during spontaneous breathing was far below the critical value associated with diaphragmatic fatigue 20. In addition, neither PI,max nor Pdi,max increased significantly after NIMV. These results are in agreement with Similowski et al. 24 and Levine et al. 25, who have shown that diaphragmatic muscle function is preserved, whereas tolerance to fatigue increased in advanced COPD. In addition, Garrod et al. 7 have found favourable results using NIMV in nonhypercapnic COPD patients, where the presence of chronic inspiratory muscle fatigue is not expected. However, a note of caution is necessary, since the first two studies were apparently performed in nonhypercapnic COPD patients and in the study of Garrod et al. 7 the simultaneous application of exercise training makes it difficult to identify the isolated effects of NIMV. Accordingly, although improbable, a primary improvement of inspiratory muscle function after NIMV, with subsequent changes in shallow breathing pattern and lung hyperinflation cannot be totally discarded. For simplicity's sake, in the following discussion it is assumed that muscle fatigue did not play a role in the present study's results. A possible explanation for the significant reduction in lung volumes after NIMV was the marked increase in expiratory time during NIMV (fig. 1⇑), which could favour the emptying of slow lung units. It is possible that a lower end-expiratory volume may be reached at the end of each ventilation session and, thereafter, be maintained by a newly adopted spontaneous pattern of breathing. Indeed, ΔPEEPi,dyn was found to be inversely related to changes in VT (r=−0.52; p<0.01) and tE (r=−0.36; p<0.05). It could be argued that lung deflation was merely the result of a reduction in airway obstruction, revealed by the significant increase in FEV1 and maximal expiratory flows observed after NIMV in these cases. Although some lung deflation may occur in response to bronchodilator treatment in severe COPD patients 26, this is an unlikely explanation for the results of the present study considering the magnitude of deflation and the absence of significant change in lung volumes in the control group, despite of the similar medication used in both groups. An increase in FEV1 (p=0.051 calculated from the published data) was also found by Elliott et al. 3. Changes in FEV1 were proportional to those of FVC, and consequently the FEV1/FVC ratio did not change, indicating that the improved maximal expiratory flow rates reflected increased volume recruitment, i.e. RV was reduced more than TLC with a resultant increase in vital capacity (VC; fig. 2⇑). Interestingly, the increase in maximal expiratory flows associated with lung deflation, mimics the functional effects of lung volume reduction surgery 27, 28. Indeed, a flow/volume curve similar to that shown in figure 2⇑, i.e. exhibiting selective reduction of RV relative to TLC with higher isovolume maximal expiratory flows and no significant effect on the expiratory time constant, has been recently described in COPD patients submitted to lung volume reduction surgery 28. In such patients, this type of response was explained by an increased lung elastic recoil at TLC 27, 28. Changes in VC after NIMV have been previously reported by Braun and Marino 29, Ambrosino et al. 30, and Perrin et al. 31, although in the latter study did not reach statistical significance. Another possible explanation for the decrease in lung hyperinflation is an improvement in airway resistance. This hypothesis is consistent with the close relationship found between ΔPEEPi,dyn and ΔRL (table 4⇑), but the reasons why airway resistance should change following NIMV are not clear and were not addressed in the present study. It could be speculated that it was secondary to persistent correction of hypoxia, considering that a primary effect of hypoxaemia is an increase of airway resistance and its correction can reduce postinspiratory inspiratory activity and dynamic lung hyperinflation 32. In addition, the improvement of alveolar ventilation might cancel out hypercapnia-induced salt and water retention 33, thus reducing airway narrowing. Recently, Burns and Gibson 34 suggested that applying positive intrathoracic pressure by NIMV could have the effect of reducing airway wall oedema. This hypothesis might also help to explain the improvement in airway resistance in these subjects and the resulting lung deflation. However, it is also possible that changes in resistance merely reflect recruitment of normal lung, previously collapsed by hyperinflated emphysematous areas, with a consequent increase in airway tethering. If the latter is true, changes in resistance should be considered more a result than a cause of lung deflation. A pattern of slow and deep breathing was also found after NIMV in this study and the reduction in Pa,CO2 was closely related to the increased VT, in line with Nava et al. 21. Similar changes in the pattern of breathing have been previously reported by several authors using negative 35–37 or positive pressure ventilation 3, 21, which were attributed to an improvement in inspiratory muscle strength 21, 35–37 or in chemosensitivity to carbon dioxide 3. Conversely, in the present study, the increase in VT was significantly related to ΔPEEPi,dyn (table 4⇑), ΔFRC (r=−0.50; p<0.005) and ΔRV (r=−0.47; p<0.005), even in the presence of a decreased drive to breathe (P0.1) and a small and nonsignificant increase in PI,max. Changes in Pa,CO2 were striking and greater than those reported in recent controlled studies 6, 21. However, this was only true for a small fraction of the patients in this study (six of 18), whereas in 12 of them, the changes were within a range of 0.53–0.67 kPa (4–5 mmHg; fig. 3⇑). As pointed out by Nava et al. 21, these findings could be explained by the presence of subgroups of patients with different levels of response to NIMV application. However, the current authors did not find nonresponders in terms of Pa,CO2 as reported by Elliott et al. 3 and by Nava et al. 21, even though the severity of COPD was very similar in the three studies, suggesting that there may be another explanation for these findings. The difference could be related to the manner in which NIMV is applied. In the above-mentioned studies 3, 6, 21, NIMV was applied during sleep and using a nasal mask, and it is known that patients using this interface may receive a lower than expected support by simply opening their mouth 38. Consequently, VTs delivered during NIMV could have been variable along the study period in those reports. It is noteworthy that using negative pressure ventilators, where the VT should be expected to be stable in well-adapted patients, mean reductions in Pa,CO2 of ∼1.06 kPa (8 mmHg) were found in the studies that closely matched these results 1. The present study suggests that COPD patients with hypercapnia and dynamic lung hyperinflation may be a particular subgroup that is likely to benefit from NIMV. Other recent studies in hypercapnic patients have given conflicting results 6, 23, 36, 39, but only two of these studies employed sham ventilation 23, 39 to rule out a placebo effect 40. Renston et al. 23 reported an improvement in exercise capacity and a reduction in dyspnoea score after only 5 days of NIMV, without changes in blood gases. Longer unsupervised studies using a mean IPAP of 12 cmH2O were unable to show improvements in blood gases and clinically relevant benefit of NIMV 39, 41. In contrast, the study of Meecham Jones et al. 6 which used an IPAP closer to that used in the present study, showed positive results. As previously mentioned, the level of IPAP appears to be important, given that higher levels are associated with significant changes in the pattern of breathing (lower respiratory rates and greater VTs) and reduction of Pa,CO2 8. In addition to all the previous possibilities, the consistent changes observed in this study may be due to the close supervision of ventilation at the laboratory and the duration of treatment in a group of patients selected for presenting hypercapnia. Another difference from previous communications is that the present study was performed in awake patients, whereas home NIMV is usually prescribed at night. As the goal was to study the physiological effects of NIMV, a daytime setting was chosen, in order to control the appropriate use of ventilators and to be able to use invasive techniques to measure respiratory system mechanics and inspiratory muscle function as needed. Although previous reports using negative pressure ventilators 22, 30, 35–37 have shown favourable results with daytime application, it should be stressed that this study was not designed to define a schedule to administer NIMV. Interestingly, daytime NIMV appears to be as effective as nocturnal NIMV in improving arterial blood gases in patients with restrictive thoracic disorders and neuromuscular disease 42. In addition, the daily time duration of NIMV in this study could be considered too short, but again it should be noted that in three recent larger studies 7, 31, 41 involving 51 patients, 17 used ventilators for ∼4 h or less due to poor tolerance. Similarly, in the frequently quoted study of Meecham Jones et al. 6 the lower limit of use was 4 h. In fact, the large variation in daily hours of use observed in the published studies, including negative and positive pressure ventilators 1, clearly reveal that an appropriate schedule is not known. One important limitation of this study is that it was not blinded for evaluators because the poor tolerance to sham-BiPAP precluded its use. In the larger study performed by Casanova et al. 41, sham-BIPAP was also discarded due to intolerance. In spite of this limitation, patients and physicians in charge of their clinical care were blinded to randomisation, thus avoiding a potential bias related to changes in their current medication. Furthermore, spirometry and lung volumes were measured by a trained nurse unaware of the purposes of the study and the randomisation of patients. Another problem is that the sham group was assigned to CPAP using a Servo Siemens ventilator, and it is known that these ventilators can impose a significant amount of work of breathing 11. A low-level pressure was used to deal with that problem, and measurements of the PTPdi confirmed that the work of breathing during ventilation sessions was not significantly increased compared with spontaneous breathing in the sham group. It was decided not to use higher levels of CPAP, because values of ∼5 cmH2O could significantly reduce PEEPi,dyn and unload inspiratory muscles 43, making results in the control group difficult to compare with NIMV patients. In summary, these results show that application of noninvasive mechanical ventilation to severe stable hypercapnic chronic obstructive pulmonary disease patients can significantly improve daytime blood-gas tensions in relation to a decrease in pulmonary hyperinflation and inspiratory loads and to the adoption of a slow deep pattern of breathing. These data do not support the hypothesis that these improvements are due to a relief in chronic inspiratory muscle fatigue. Consensus Conference. Clinical indications for non-invasive positive pressure ventilation in chronic respiratory failure due to restrictive lung disease, COPD, and nocturnal hypoventilation. A consensus conference report. Chest 1999;116:521–534. Mehta S, Hill NS. Noninvasive ventilation. Am J Respir Crit Care Med 2001;163:540–577. Elliott MW, Mulvey DA, Moxham J, Green M, Branthwaite MA. Domiciliary nocturnal nasal intermittent positive pressure ventilation in COPD: mechanisms underlying changes in arterial blood gas tensions. Eur Respir J 1991;4:1044–1052. Díaz O, Ramos J, Gallardo J, Torrealba B, Lisboa C. Ventilación mecánica no invasiva en pacientes con enfermedad pulmonar obstructiva crónica estable. Rev Med Chile 1999;127:647–654. American Thoracic Society. Standards for the diagnosis and care of patients with chronic obstructive pulmonary disease (COPD) and asthma. Am Rev Respir Dis 1987;136:225–243. Meecham Jones DJ, Paul EA, Jones PW, Wedzicha JA. Nasal pressure support ventilation plus oxygen compared with oxygen therapy alone in hypercapnic COPD. Am J Respir Crit Care Med 1995;152:538–544. Garrod R, Mikelsons C, Paul EA, Wedzicha JA. Randomized controlled trial of domiciliary non-invasive pressure ventilation and physical training in severe chronic obstructive pulmonary disease. Am J Respir Crit Care Med 2000;162:1335–1341. Nava S, Ambrosino N, Rubini F, et al. Effect of nasal pressure support ventilation and external PEEP on diaphragmatic activity in patients with severe stable COPD. Chest 1993;103:143–150. Tuxen DV, Lane S. The effects of ventilatory pattern on hyperinflation, airway pressures, and circulation in mechanical ventilation of patients with severe airflow obstruction. Am Rev Respir Dis 1987;136:872–879. O'Donnell DE, D'Arsigny C, Webb KA. Effects of hyperoxia on ventilatory limitation during exercise in advanced chronic obstructive pulmonary disease. Am J Respir Crit Care Med 2001;163:892–898. Brochard L, Rua F, Lorino H, Lemaire F, Harf H. Inspiratory pressure support compensates for the additional work of breathing caused by the endotracheal tube. Anesthesiology 1991;75:739–745. American Thoracic Society. Standardization of spirometry: 1994 update. Am J Respir Crit Care Med 1995;152:1107–1136. Knudson RJ, Lebowist MD, Holberg CI, Burrows B. Changes in the normal maximal expiratory flow-volume curve with growth and age. Am Rev Respir Dis 1983;127:725–734. Quanjer PH, Tammeling GJ, Cotes JE, Pedersen OF, Peslin R, Yernault JC. Lung volumes and forced ventilatory flows. Report work party: Standardization of lung function testing. Eur Respir J 1993;6:Suppl. 16, s5–s40. Bégin P, Grassino A. Inspiratory muscle dysfunction and chronic hypercapnia in chronic obstructive pulmonary disease. Am Rev Respir Dis 1991;143:905–912. Lessard MR, Lofaso F, Brochard L. Expiratory muscle activity increases intrinsic positive end-expiratory pressure independently of dynamic hyperinflation in mechanically ventilated patients. Am J Respir Crit Care Med 1995;151:562–569. Whitelaw WA, Derenne JP, Milic-Emili J. Occlusion pressure as a measure of respiratory center output in conscious man. Respir Physiol 1975;23:181–199. Hussain S, Pardy R, Dempsey J. 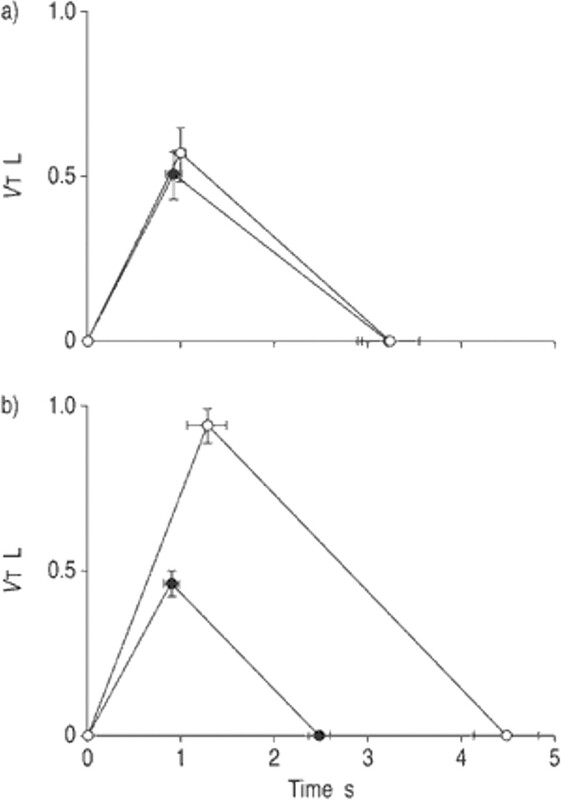 Mechanical impedance as determinant of inspiratory neural drive during exercise in humans. J Appl Physiol 1985;59:365–375. Field F, Sanci S, Grassino A. Respiratory muscle oxygen consumption estimated by the diaphragm pressure-time index. J Appl Physiol 1984;57:44–51. Bellemare F, Grassino A. Effect of pressure and timing of contraction on human diaphragm fatigue. J Appl Physiol 1984;53:1190–1195. Nava S, Fanfulla F, Frigerio P, Navalesi P. Physiologic evaluation of 4 weeks of nocturnal nasal positive pressure ventilation in stable hypercapnic patients with chronic obstructive pulmonary disease. Respiration 2001;68:573–583. Fernandez E, Weiner P, Meltzer E, Lutz MM, Badish DB, Cherniack RM. Sustained improvement in gas exchange after negative pressure ventilation for 8 hours per day on 2 successive days in chronic airflow limitation. Am Rev Respir Dis 1991;144:390–394. Renston JP, DiMarco AF, Supinsky GS. Respiratory muscle rest using nasal BiPAP ventilation in patients with stable severe COPD. Chest 1994;105:1053–1060. Similowski T, Yan S, Gauthier AP, Macklem PT, Bellemare F. Contractile properties of the human diaphragm during chronic hyperinflation. N Engl J Med 1991;325:917–923. Levine S, Kaiser L, Leferovich J, Tikunov B. Cellular adaptations in the diaphragm in chronic obstructive pulmonary disease. N Engl J Med 1997;337:1799–1806. O'Donnell DE, Forkert L, Webb KA. Evaluation of bronchodilator responses in patients with “irreversible” emphysema. Eur Respir J 2001;18:914–920. Sciurba FC, Rogers RM, Keenan RJ, et al. Improvement in pulmonary function and elastic recoil after lung-reduction surgery for diffuse emphysema. N Engl J Med 1996;334:1095–1099. Ingenito EP, Loring SH, Moy ML, Mentzer SJ, Swanson SJ, Reilly JJ. Interpreting improvement in expiratory flows after lung volume reduction surgery in terms of flow limitation theory. Am J Respir Crit Care Med 2001;163:1074–1080. Braun NM, Marino WE. Effect of daily intermittent rest of respiratory muscles in patients with severe chronic airflow limitation (CAL). Chest 1984:59s–60s. Ambrosino N, Montagna T, Nava S, et al. Short term effect of intermittent negative pressure ventilation in COPD patients with respiratory failure. Eur Respir J 1990;3:502–508. Perrin C, El Far Y, Vandenbos F, et al. Domiciliary nasal intermittent positive pressure ventilation in severe COPD: effects on lung function and quality of life. Eur Respir J 1997;10:2835–2839. Bonora M, Vizek M. Lung mechanics and end-expiratory lung volume during hypoxia in rats. J Appl Physiol 1999;87:15–21. Palange P. Renal and hormonal abnormalities in chronic obstructive pulmonary disease (COPD). Thorax 1998;53:989–991. Burns GP, Gibson GJ. A novel hypothesis to explain the bronchoconstrictor effect of deep inspiration in asthma. Thorax 2002;57:116–119. Scano G, Gigliotti F, Duranti R, Spinelli A, Gorini M, Schiavina M. Changes in ventilatory muscle function with negative pressure ventilation in patients with severe COPD. Chest 1990;97:322–327. Gigliotti F, Spinelli A, Duranti R, Gorini M, Goti P, Scano G. Four-week negative pressure ventilation improves respiratory function in severe hypercapnic COPD patients. Chest 1994;105:87–94. Gutiérrez M, Beroíza T, Contreras G, et al. Weekly cuirass ventilation improves blood gases and inspiratory muscle function in patients with chronic air-flow limitation and hypercarbia. Am Rev Respir Dis 1988;138:617–623. Carrey Z, Gottfried SB, Levy RD. Ventilatory muscle support in respiratory failure with nasal positive pressure ventilation. Chest 1990;97:150–158. Gay PC, Hubmayr RD, Stroetz RW. Efficacy of nocturnal nasal ventilation in stable, severe chronic obstructive pulmonary disease during a 3-month controlled trial. Mayo Clin Proc 1996;71:533–542. Shapiro SH, Ernst P, Gray-Donald K, et al. Effect of negative pressure ventilation in severe chronic obstructive pulmonary disease. Lancet 1992;340:1425–1429. Casanova C, Celli B, Tost L, et al. Long-term controlled trial of nocturnal nasal positive pressure ventilation in patients with severe COPD. Chest 2000;118:1582–1590. Schonhofer B, Geibel M, Sonneborn M, Haidl P, Kohler D. Daytime mechanical ventilation in chronic respiratory insufficiency. Eur Respir J 1997;10:2840–2846. Appendini L, Patessio A, Zanaboni S, et al. Physiologic effects of positive end-expiratory pressure and mask pressure support during exacerbations of chronic obstructive pulmonary disease. Am J Respir Crit Care Med 1994;149:1069–1076.